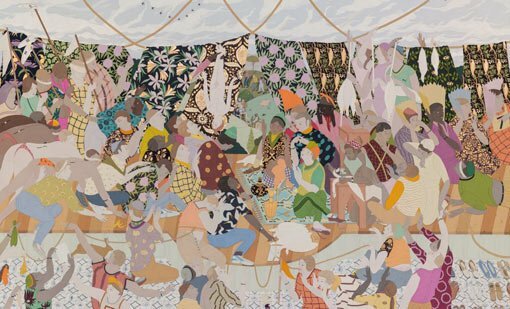 Based in Dunedin, New Zealand, where she grew up amongst her parents’ collections of Indian miniatures and Japanese woodblock prints, Kushana Bush paints amongst a library’s worth of books and archival material, and the sound of the news on her radio. In painstaking strokes of gouache, she traverses a vast array of sources – from Mughal miniatures and medieval books of hours to, as we hear in this interview, water-skiing and sportswear – to seamlessly infuse historical references with symbols of our contemporary world. 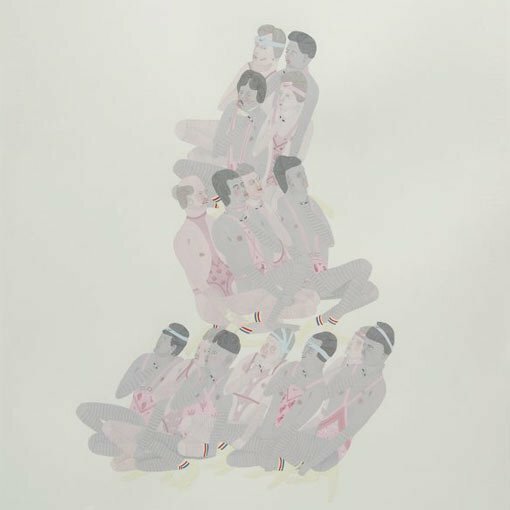 Last year, the Gallery acquired one of her most ambitious works to date, Here we are 2016. An earlier work – Pressed open hook 2009 – is currently on display in Out of the ordinary: works from the ARTAND Emerging Artist Collection . 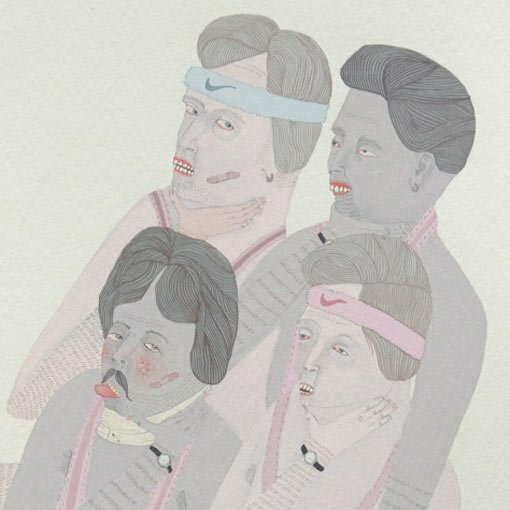 The exhibition presents works by Australian and New Zealand contemporary artists who engage with everyday materials and imagery in surprising and transformative ways. Each work was created in the early stages of the artist’s career and demonstrates a keen spirit of experimentation, while also illuminating the direction and development of the artists’ current practice. 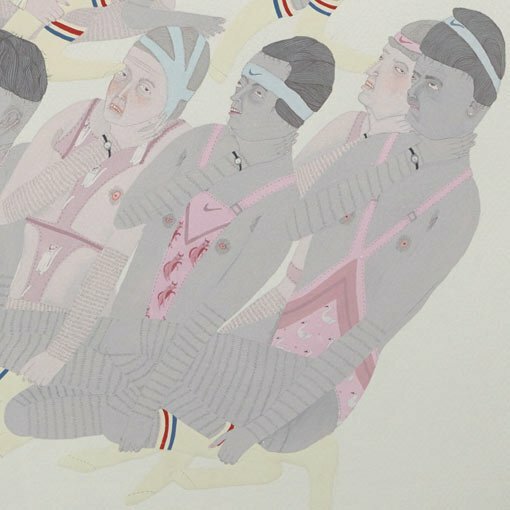 A human pyramid of eccentric wrestlers, a zigzagging group of sporty worshippers; who exactly are we looking at here? I’m often asked who it is I am painting; my answer is always a firm – in no way are my paintings self-portraits. Bear in mind, artists are the biggest liars I know, and are especially good at lying to themselves. In 2010 I had just survived my first years of living off painting sales as my only income. Looking back, I can see why those hyperventilating people look so concerned and risk toppling over at any second. It looks like I have not even been kind enough to supply them with inhalers! Theatre and paintings often use ‘the fool’ to stand in for that lost or searching someone – that the artist often identifies with – and I think these laughable gym bunnies have something of ‘the fool’ in them. Most of us in the modern world can relate to their endless futile search for meaning. When we recognise ourselves in these foolish wrestlers, our sniggering stops. Your imagery seamlessly blends a range of historical and contemporary references. Do you consider your imagery to be set in, or from, a certain period of time? The best of my works duck and dive out of any specific time and place. The use of gouache in a miniature format took form from some of the medieval illuminations I discovered at this time. Those were images that could be shut away in books, but I was trying to attempt a similar thing for the modern audience, large scale and on a wall. I’ve had a little one-page photocopy in the studio for years of the First seven modes of prayer of St Dominic (illustrations for Los nueve modos de orar , a 14th-century work in the Monasterio de Santo Domingo el Real, Madrid). This very simple illustration depicts a man doing his daily exercises of ‘devotional gymnastics’ – think planking and downward dog. I loved how it was a manual in how to achieve ecstasy. His little positions inspired me to think that the body has played an important role in prayer and attainment of spiritual wellbeing. The subjects of your paintings always have the most intriguing attire – and Pressed open hook is no exception. Do you see clothing as a key social signifier, a way to tell us something about your ‘little people’? Sometimes when I’m out in the real world (I’d guess 90% of my waking life is in the studio) I simply wonder why am I drawn to that? It can start with a tube sock I wish I never saw on a long walk and it ends up lasting in the work for a very long time. In our day-to-day we pay no attention to a Nike tick, a wristwatch and a tube sock, but as soon as it is placed in a gallery we demand its concrete symbolic importance. Boy, that’s a powerful thing for an artist, the most wonderfully alluring hot potato. 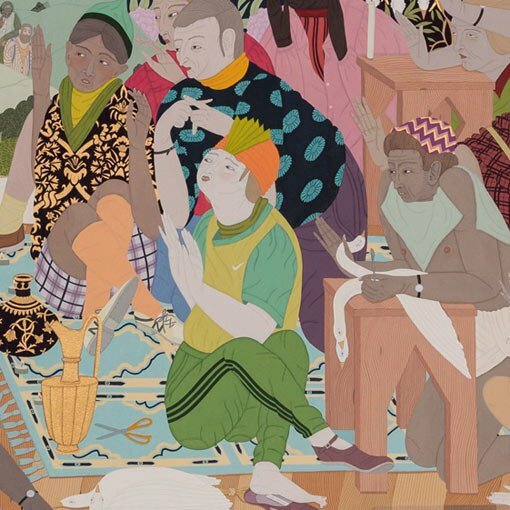 The Gallery has also acquired a recent painting of yours, Here we are , which is compositionally more ambitious than this earlier piece, with a much tighter brocade of imagery, broader range of colour, and executed on a much larger scale. What processes and ideas were you exploring at this moment of your career? I think, in areas, there is this same occasional compositional clumping of figures which I learnt from my dalliance with flower arranging. This compositionally helps to carry the eye to parts of the painting and rest them there until the next point takes over. Instead of stage directions, in my most recent works, I have now literally given them a stage (and when I say ‘them’ I mean my little people). Their clothing is often a little more conservative but not always. I think they look out to the world more too; they reflect my spy hole on world events and daily events in a way that my works in 2009 weren’t able to. Also today, eight years on, I would never think to humiliate my little people, I now know who is in charge. I notice too – the wristwatches. They were there in 2009! I know! One day the clock will stop though. Gulp.